Abell Point Marina strikes double gold! 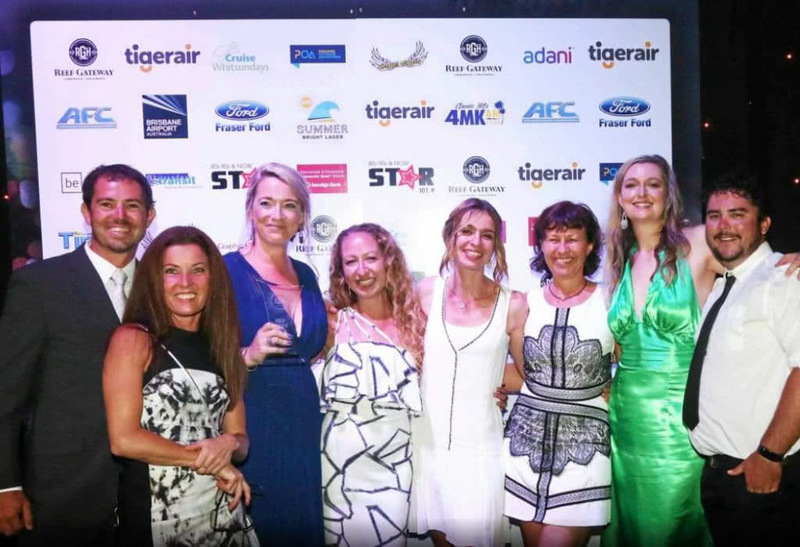 It was a record attendance at the 2017 Whitsunday Tourism Awards at Hamilton Island this weekend. Over 340 attended the gala dinner with representatives from local tourism operators, regional and state tourism bodies, and local and state government, all gathering together to celebrate the achievements of the tourism industry this year. The message for the night was that the Whitsundays is ‘batting well above average’ with the quality of tourism product on offer in the region and the number of visitors to the region each year, indicating the Whitsundays a ‘must see global destination.’ Fourty-one local businesses were recognized for their contributions to the tourism industry and Abell Point Marina was awarded with Major Tourism Attraction for the second year running. Accepting the award, Joscelyn O’Keefe, Abell Point Marina’s Marketing & Business Development Manager, spoke of the vision of marina owner Paul Darrouzet to create a world-class destination marina in the Whitsundays. After being recognized as Marina of the Year 2017 and now Major Tourism Attraction for the Whitsundays, Abell Point is certainly realizing that vision. The dedication of the marina team was acknowledged on the night, as was the contribution of the first-class tourism operators who call Abell Point home. Taking out a swage of Gold and Silver awards, Abell Point’s operators were on a winning streak: Ocean Rafting (Gold – Major Tour and Transport Operator), Red Cat Adventures (Gold – Adventure Tourism, Tour and Transport Operator), Island Jet Boating (Gold – New Tourism Business), Whitsunday Escape (Gold – Unique Accommodation), Cumberland Charter Yachts (Silver – Unique Accommodation), Whitsunday Jetski Tours (Silver – Adventure Tourism), Whitsunday Bliss (Silver – Deluxe Accommodation). Lure, the marina’s waterfront function venue, also took out gold in the Specialised Tourism Service category. Lure offers a contemporary venue for weddings, events and conference and has been operational just over twelve months. Lure was the first venue on the mainland to host a wedding just six days after Tropical Cyclone Debbie crossed the mainland Whitsunday coast and the event team have worked tirelessly over the last year to develop the Lure brand. Abell Point Marina have been nominated for the Queensland Tourism Awards, which take place in November.